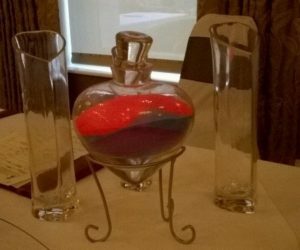 A marriage can be symbolised by the pouring together of two individual containers of sand in a Unity Sand Ceremony, representing each of the couple and all that they were. As these containers of sand are poured into the third container, the grains of sand can never again be separated. In addition, as in this photograph, a child or children in the family could join in by adding their container of sand, representing all that they are as a family, and that they will ever be. 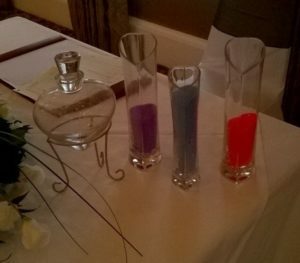 Wording that accompanies the Sand ceremony may be as shown below, but your celebrant can talk you through this to ensure it is right for you. “Love is a force more formidable than any other. It cannot be seen or measured, yet it is powerful enough to transform you in a moment, and offer you more joy than any material possession ever could. But although this love joins you together as one, remember the gift of your individuality. Cherish and affirm your differences as you love each other. Be supportive of your strengths, and tender towards your weaknesses.